Research carried out in Strangford Lough is at the cutting edge of the global search for sustainable energy. For around a decade locals have been used to the Seagen tidal turbines out in the sound between Strangford and Portaferry. Although the tower is still there, it is no longer working. 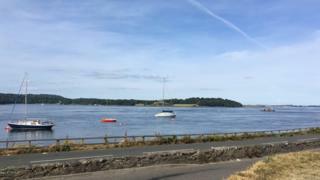 But the next generation of devices is being tested by Queen's University at an innocuous-looking barge up the lough from the Portaferry car ferry slipway. And there is huge international interest. Image caption Seagen - the first project in Strangford - is no longer working. "We have to start thinking now about how we generate our energy in the future because we live in an energy-hungry society," Professor Mark Price, Pro Vice Chancellor of Engineering at Queen's University, told BBC News NI. "In terms of cutting edge, no one else is testing on this scale in the water, in the marine environment. "There's nothing quite like coming out into Strangford and battling the elements to see what happens when you put a device in water." Professor Trevor Whittaker, who has been looking into wave and tidal energy for 40 years, said the research allows analysts to see how the turbines behave in real tidal flow. So, who is paying for it all? Queen's is carrying out the research for the Centre for Advanced Sustained Energy (CASE) which is part of Invest NI but local and international companies are funding it too - and taking the information it is getting and using it to improve their existing systems.